3Gstore.com Blog: Sprint 250U Modem, First 3G/4G Modem With an Antenna Port, In Stock at 3Gstore! 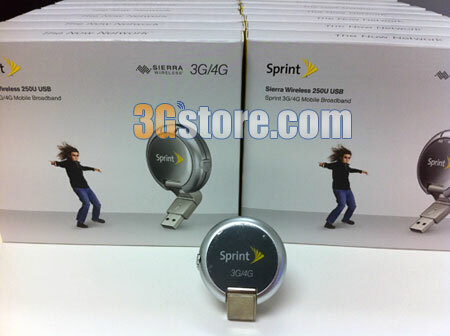 Sprint 250U Modem, First 3G/4G Modem With an Antenna Port, In Stock at 3Gstore! The 250U is not the first 3G/4G-capable device, but it is the first to feature something potential users have been hoping for since the very first 3G/4G device: an antenna port for improving cellular signal. The 250U actually features two antenna ports: one for a 3G antenna, and one for a 4G antenna (which aren't yet available, but will be in the future). This really sets the 250U apart from its predecessors and makes it more accessible to a lot more potential users - mobile broadband users who rely on antennas to get a reliable signal for their 3G aircards have been hesitant to make the move to a 3G/4G device, but now users don't have to sacrifice the ability to easily boost 3G signal in order to get a 3G/4G modem! The 250U if fully compatible with Mac and Windows computers, as well as all of the 4G-capable Cradlepoint routers with the latest firmware. For more details on the 250U, you can read our complete review: Sierra 250U 3G/4G USB Modem. The Sprint 250U is now available from 3Gstore for $19.99 with a new 2-year contract, and you'll receive a $50 mail-in rebate (meaning you MAKE $30 after rebate!). Plus, you can get $20 off any 3G antenna and $20 off any router when you order the 250U with Sprint service rom 3Gstore!